“Summertime and the livin’ is easy,” goes the song…and so it is. Summer in Telluride means you don’t have to shovel the snow off your car or wear wool socks, and here in the mountains, it’s never so hot that you’ll need air conditioning. The days are long and full of fun, so it’s best to keep your entertaining simple: Chef Sergio Gonzalez offers his recipe for Scampi Allo Scoglio, a divine dish that is uncomplicated to prepare. 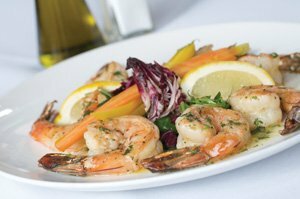 Stir the lemon juice into the olive oil and season to taste with salt and pepper, then brush the shrimp with this mixture and marinate at room temperature for 30 minutes. Preheat the oven to 350º or 375º. Pour off the marinade into a roasting pan and warm over moderate heat with the garlic. Add the shrimp to a skillet with a little cooking oil that has been heated to a smoking point. Sear the shrimp less than a minute—just until its color changes and it becomes opaque and curled. Put the skillet along with the shrimp into the oven and cook for another five to seven minutes. It should be cooked thoroughly, but not dry. Bring the roasting pan to the stovetop. Discard the garlic; add the shrimp scampi and butter dusted in flour and cook until the butter dissolves completely. Season to taste with salt and pepper. Arrange the shellfish on a platter and sprinkle with parsley. Serve hot.